When Bliss Lau announced me she was pregnant I obviously was super happy with her, not to mention she was due around my own birthday, September 10th. Anyways, she also told me she created a new collection in honor of this new life she was carrying, her baby daughter Soa which was born on…2 weeks ago. This collection is actually not only dedicated to her daughter Soa but also to her late father, Edson Lau. The Life collection is an autobiographical collection an and is created as an homage and a celebration, which also makes this her most personal work. Each piece is made in 18k gold and with thoughtful chosen, powerful stones. Rooted in the healing and centering energies of Gold, Crystal Quartz and Black Jade, she calls this collection life. Again, a collection which stands for life and death, as a homage to people she loves. About the stones, they are very carefully chosen and have a personal meaning and memory to Bliss herself. Crystal Quartz, sourced from Arkansas, was chosen for its energy-absorbent properties. “I have been wearing the life Collection’s Crystal Quartz pieces with the idea that I could capture the energy of this new life and experience into the crystal, and then keep and treasure it as Soa grows older. I see this as an idea that can translate not only into the physical birth of a child, but also the birth of an idea and the vibrancy of any new experience that is created by you. The simple truth is that we often forget the time when things are new and pure. The Crystal Quartz pieces are meant to be a keepsake and a reminder of those times in our lives, whatever the circumstances.” explains Bliss. Black Jade is dedicated to her father. This stone is non-invasively mined in Australia and is known as a protective and healing stone that bestows “bodyguard” properties to all who wear it. Jade resonates deeply with Bliss’ Chinese-American heritage. As a token, keepsake or talisman, Black Jade can be worn as an homage to a loved one who is now elsewhere. The life Collection is composed of three pieces: The Halo Necklace, the large and small Brevity pendants, and the Brevity bracelet. Keep scrolling to get to know them! Worn alone or as an elegant foundation for the life Collection’s Brevity pendants, the Halo Necklace is a carefully conceived piece, deceptive in its simplicity. For more than a decade, beautifully layered necklaces and body chains have been a BLISS LAU signature, and she’s known for her ability to beautifully frame and highlight the body. 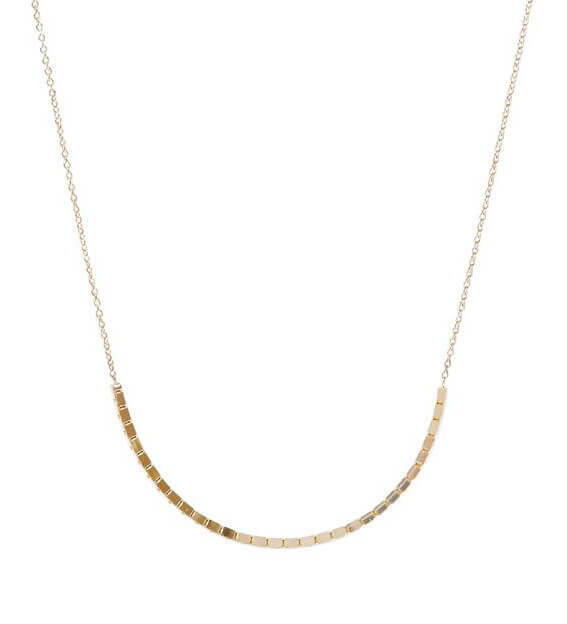 The Halo Necklace is carefully weighted to hang in just the right curve. The interplay of thick and thin elements allows the piece to trace and accentuate the most elegant parts of the form — in this case, the clavicle — while hanging gently in a perfect half-circle. Bliss wearing the Halo Brevity Crystal Quartz small pendant, which comes as 16 inch. The Large Halo Brevity Crystal Quartz pendant has a 26 inch chain. 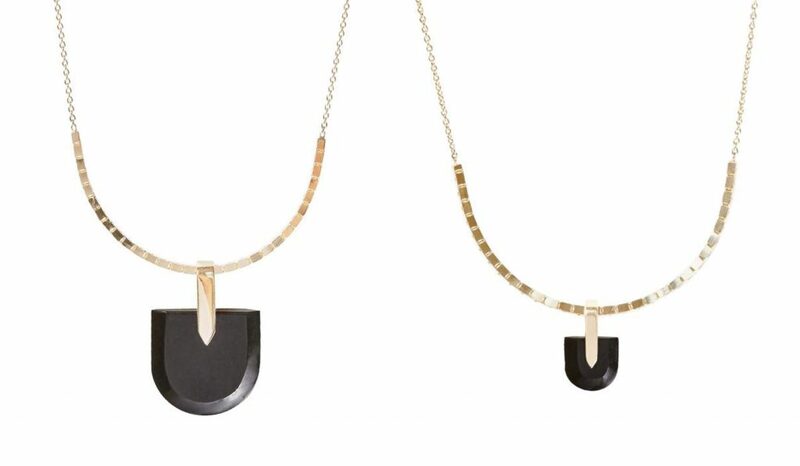 The Large Brevity Pendant was created during Bliss’ pregnancy, and inspired by her growing daughter’s immense creative energy, the Brevity Pendant features healing Crystal Quartz or protective Black Jade cut with a knife edge along its curve to create a shape that’s both simple and graceful. Suspended by a single gold bail, the arc of this large pendant mirrors that of the Halo Necklace — its intended partner. The Small Brevity pendant is a smaller version, but no less powerful, version of the Large Brevity Pendant. 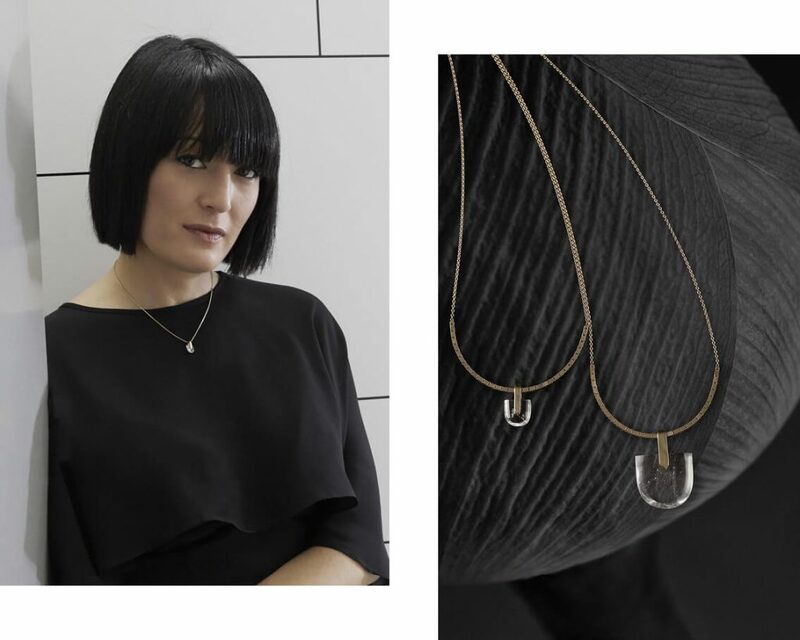 Combining elegantly curved stone and a sleek gold bail, this pendant is the embodiment of quiet strength. Equally beautiful in protective Black Jade or energy-absorbing Crystal Quartz, both ethically sourced and meticulously cut. This pendant works beautifully with the Halo Necklace, providing several style options whether worn over the thick or thin portions of the chain. Combining a complex amalgamation of shapes, the Brevity Bracelet took more than a year to perfect. Black Jade and Crystal Quartz are meant to be worn against the skin, engaging the body in their deeply healing, protective powers. The shape of the bracelet is triangular and flat along the skin as it coils around the wrist with a Saturn-esque curve. The powerful stone is wrapped in gold with a balancing detail just at the center meant to convey the centering power the bracelet bestows upon its wearer.